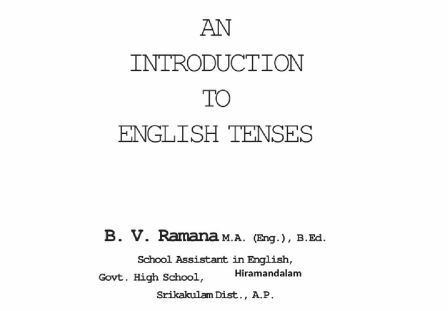 ➤"An introduction to English tenses" book prepared by B.V.Ramana , SA English , Srikakulam Dt., This 'Introduction To English Tenses' gives rudimentary idea about the forms of all tenses and basic use of each tense. The tense tables of this book proves to be useful to the children for getting tongue training necessary for acquisition of language skills. ➤Tense means "any of the form of the verb that may be used to indicate the time of action or state expressed by the verb. 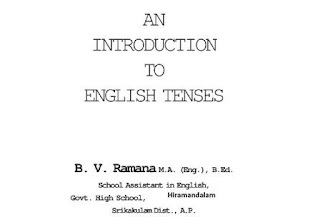 "In grammar, tense is a category that expresses time reference with reference to the moment of speaking. Tenses are usually manifested by the use of specific forms of verbs, particularly in their conjugation patterns. Basic tenses found in many languages include the past, present, and future. Tenses generally express time relative to the moment of speaking. In some contexts, however, their meaning may be relativized to a point in the past or future which is established in the discourse . This is called relative tense.